OCTOBER 2014, HIGH POINT, NC - In a bit of a direction change from the past few seasons in which we have seen the dominance of strong colors such as orange, blues and yellows, the pendulum is turning somewhat toward a neutral story. Within the emerging neutrals, gray and taupe are still important. But warmer neutrals such as bronze tones are coming back. Marge Carson presents a dramatic neutral palette this market, with a sprinkling of accents in the blue family from turquoise to gray blue to indigo blue. Perfect for the seamless living of today's open floor plans and loft-like spaces, the Memphis conversation sofa with its open bumper ends and T-back with nail head trim can float in a room, acting as a casual and inviting room divider. The bumper ends provide seating in either direction. 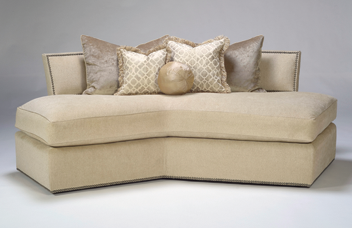 The body fabric is textured, pleated chenille called Antonio Shar-Pei, giving a casual feel to the sofa. It is accented by Leather Ogee, ivory leather with a hand-applied metallic gold geometric pattern. Notably, this sofa is in a smaller-scaled 98-inch width. 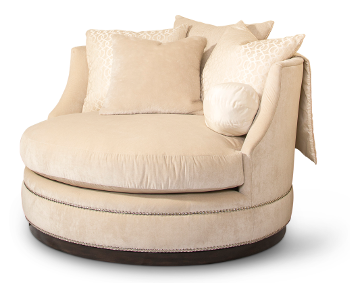 Pivot to the center of the action in this oversized round chair-and-a-half that swivels 360 degrees on a wood plinth base. It's perfect for media rooms, a large great room, beside a fireplace or anywhere there is more than one conversation area or focal point and a need to face multiple directions! The body fabric is Daylight Champagne, mohair-look textured velvet, accented by Pandora Champagne, a natural linen fabric with an ivory ironwork pattern.  Waverly is offered in two widths: 54 and 44 inches. 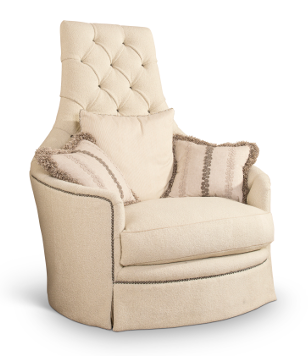 This throne-like statement chair is 53 inches wide and a staggering 61 inches tall, offering a super-dramatic focal point for an expansive and elegant room setting. Can you visualize it beneath a floating staircase or one on either side of a massive stone fireplace? The body fabric is the heavily textured Board Walk Snow, giving a cozy and inviting feel. The pillows are in natural linen with a hand- embroidered vine pattern.